Contains bonus content from PS2 and PS3 versions. Frame rate is capped at 30 FPS, due to being direct port of the PlayStation 3 version, not the GameCube version. Contains minor bugs (see Bug Reports / Feature Requests). 2.1 Tales of Symphonia "Fix"
VMProtect DRM was removed via a patch on February 29, 2016. Internal rendering resolution is locked at 1280x720. 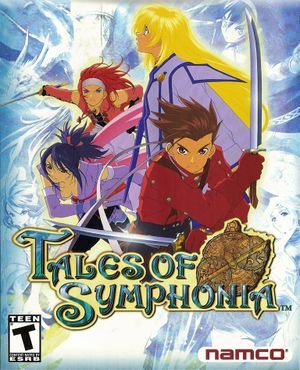 Use Tales of Symphonia "Fix" to fix. Use Tales of Symphonia "Fix". Capped at 30 FPS. Use Tales of Symphonia "Fix" for 60 FPS menus and world map. 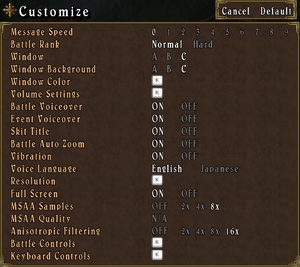 For proper DualShock button prompts use Tales of Symphonia "Fix" and SKIM for downloading corresponding texture mod. See Bug Reports / Feature Requests for known issues. MSI Afterburner, RivaTuner, Steam overlay, etc. Game seems to always freeze when there is controller rumble being used. ↑ 2.0 2.1 File/folder structure within this directory reflects the path(s) listed for Windows and/or Steam game data (use Wine regedit to access Windows registry paths). Games with Steam Cloud support may store data in ~/.steam/steam/userdata/<user-id>/372360/ in addition to or instead of this directory. The app ID (372360) may differ in some cases. Treat backslashes as forward slashes. See the glossary page for details.